IS113 Can Producers Set Their Own Animal Care Standards? IS114 The Ethics of Cloning: When Should It Be Legal? IS116 Is It Right To Use Animals for Research Purposes? IS117 Is USDA's National Animal Identification a Good Idea? IS118 How Should Cloned Animals Be Used? IS127 Should Genetically Modified Foods Be Labeled? IS128 Are We Doing Enough To Stop the "Mad Cow" Risk? IS131 Why the Clash Between Agriculture and Environment? IS133 How Can We Best Protect Public Forests? IS137 Are Farmers Poisoning the Gulf of Mexico? IS140 How Should the Endangered Species Act Be Reformed? IS144 Can Agriculture Help to Solve America's Energy Shortfall? IS161 Why Should Farmers Get Special Treatment From the Government? IS162 Who Supports and Who Opposes Farm Programs? IS163 Why Can't Farmers Survive Without So Much Government Subsidy? IS164 When Should Farmers Get "Emergency Aid" from Government? IS166 Should Meatpackers Be Allowed To Own and Produce Livestock? IS167 Is It Fair To Force Producers To Pay for Promotions? IS172 NAFTA: a Success or a Failure? IS272 Will More Free Trade Agreements Help U.S. Agriculture? IS175 Should Food Be a Weapon of U.S. Foreign Policy? IS176 Have We Stopped the Threat of Foot-and-Mouth Disease? IS183 Could Biotechnology Backfire on Farmers? IS186 How Can We Stop the Spread of Altered Genes? IS191 Is There a Career for Me in Agriculture? IS193 Is Biotechnology Still a Promising Career Opportunity? IS194 Is Value-Added Agriculture in Your Future? IS195 Is There a Future for Me in the Organic Industry? 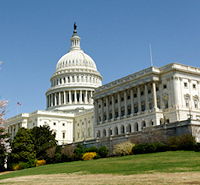 Photo credit: GSA photo shows U.S. capitol building.